J.M. Martinez-Tarifa, J.A. Ardila-Rey, G. Robles Partial discharge source recognition by means of spectral power ratios clustering, Measurement, Science and Technology, Vol 24, Issue 12, December 2013, pp 125605 (10pp). Abstract – Partial discharge (PD) detection can give useful information for the diagnosis of electrical apparatuses, but data interpretation can be impossible if several sources are simultaneously active. Pulse characterisation can be used to identify the source origin in PD measurements. The distribution of energy at different frequencies helps to distinguish between several types of discharges. The parameterisation of pulses by means of spectral power ratios (PR) has been studied as a reliable technique to represent different characteristics in high-frequency current pulses in high-voltage tests. In this study, the separation of partial discharge sources by means of power ratios maps is proposed. 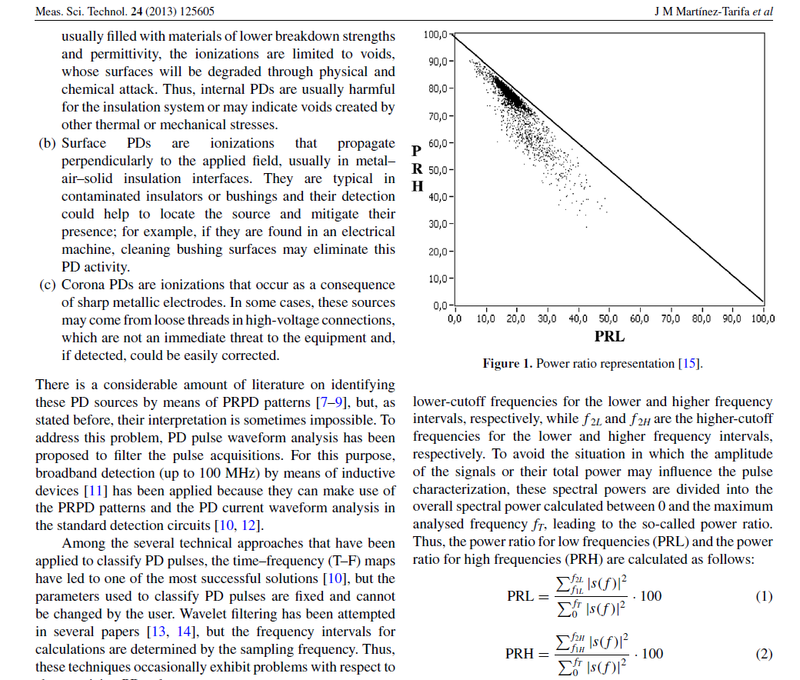 This approach has proven to be effective in the identification of PD sources when two electrical insulation systems are simultaneously subjected to discharge activity in controlled experiments where internal, surface and corona discharges were occurring. The flexibility of the system to improve cluster separation is shown, and measurements are also made on a real insulated power cable, where two simultaneous PD sources were successfully identified. Keywords – partial discharges, electrical insulation, power ratio maps, clustering techniques, spectral power. Abstract – Partial discharges (PD) are a clear ageing agent on insulating materials used in high-voltage electrical machines and cables. For this reason, there is increasing interest in measuring this phenomenon in an effort to forecast unexpected failures in electrical equipment. In order to focus on harmful discharges, PD pulse shape analysis is being used as an insulation defect identification technique. 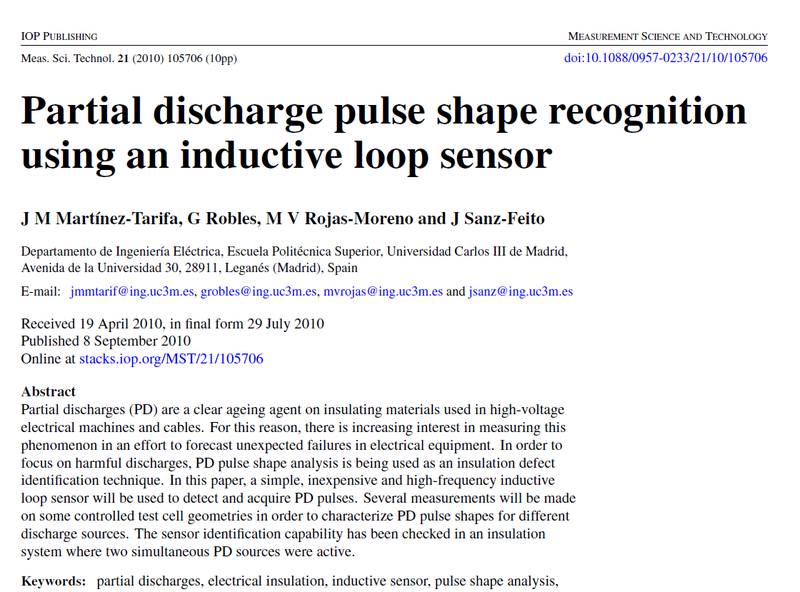 In this paper, a simple, inexpensive and high-frequency inductive loop sensor will be used to detect and acquire PD pulses. Several measurements will be made on some controlled test cell geometries in order to characterize PD pulse shapes for different discharge sources. The sensor identification capability has been checked in an insulationsystem where two simultaneous PD sources were active. Keywords – partial discharges, electrical insulation, inductive sensor, pulse shape analysis, pulse identification.